During the course of a short expedition to the Eastern Region of Abu Dhabi Emirate at the end of December 1980, a dry wadi debouching from the central west flank of Jebel Hafit was surveyed for its flora distribution. This wadi emerges from the base of the mountain on a clearly defined route that twists between deepening banks for some two kilometres before fanning out and losing its identity in the dunes near Sha'b al Ghaf on the Ain al Faidah - Al Wiggan road. The wadi banks surveyed were very rocky and the only sand was that which had accumulated as runoff from Hafit. There was little or no evidence of aeolian sand introduced from the desert. Stands of Euphorbia larica ( = E. arabica ? Boiss) dotted the banks and lower reaches of the mountain. This plant has numerous thin branches rising very densely from a thick woody base. There was no evidence of recent flower or seed development. (Specimens in late fruiting stage had been recorded near Masafi in late October). The plants here were up to l.5 metres high, and seemed resistant to heavy grazing. 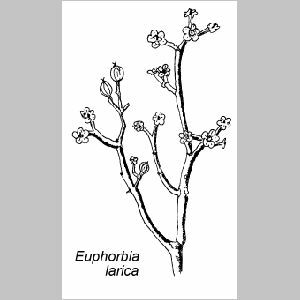 Though classified as a non-succulent, E. larica appears as such; the slender linear leaves remain the same healthy-looking green throughout the year, and when cut or damaged they exude a supposedly poisonous white sap. Common farther out in the sands, a few isolated plants of Tephrosia apollinea, in poor condition, were recorded in the wadi bed and amongst the lower scree levels. All examples appeared young but struggling, with discoloured leaves and a thin, straggly outlook. This compares with the clumps just a kilometre further west among the dunes, which were much larger and in flower and fruit. In the wadi bed the largest plants were barely 25 cms. high, compared with up to three times that height in the more acceptable habitat. A few isolated Acacia species up to 4 metres tall were strung out along both banks, and further trees dotted the lower jebel. There were no flowers or fruit and the exact species could not be identified. A few trees in the wadi bed were badly bent and broken as a result of old floods. The lower branches of all examples recorded were heavily grazed, as is typical throughout the region. One or two Zygophyllum (coccineum?) plants were recorded even on the lower mountain levels, but they were noticeably less dense than their counterparts which are abundant throughout the Emirate especially in saline depressions and along the coast. These specimens on lower Hafit were very isolated, and the leaves were paler with a lot more orange and yellow than is usual in Zygophyllum. In the jumble of rocks where the wadi emerges, several specimens of Chrozophora verbascifolia were recorded. These were up to half a metre tall, with tight flower buds and green berries. These annual herbs somewhat resemble the common nettle with leaves woolly rather than hairy. Two specimens were noted further down the wadi, but these were clearly strays out of their element, unhealthy and stunted in appearance. The leaves are much larger than in C. obliqua and the species is stiffly erect, unlike the semi-prostrate C. plicata. The spiny but slender Fagonia indica was represented by a few poor specimens along the wadi bed but without flowers or fruit. Further up the jebel isolated Fagonia species were recorded including one very healthy plant in full flower (purple-pink) and fruit that may be F. brugieri, with spines longer than those commonly found on F. indica. This species is often found in rocky habitats throughout the country but may also be found in predominantly dune areas. 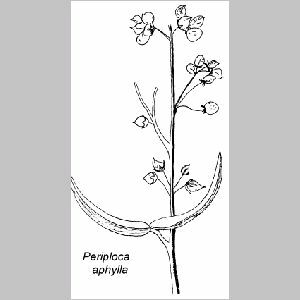 Of the larger plants, Periploca aphylla was represented only in the lower rocky regions. The plants higher up were in flower and seed, whereas the lower ones had finished flowering completely. This plant has characteristic horizontally diverging seed follicles, containing an abundance of hairy seeds which are wind dispersed. When the follicles split the seeds emerge and cover their case like a woolly layer. At the lower levels most of the seeds had dispersed. Though similar at first glance to E. larica this plant belongs to the Asclepiadaceae family. A single specimen of suspected Dodonaea viscosa, two metres long but pointing at an angle from the base because of a huge overhanging boulder, was recorded. Its leaves were elongated (c. 12 x 1.5 cms. ), bright shiny green, and tapering at the base. Many leaves had been half eaten by leaf-cutting insects but none were seen. There were no flowers or fruit. 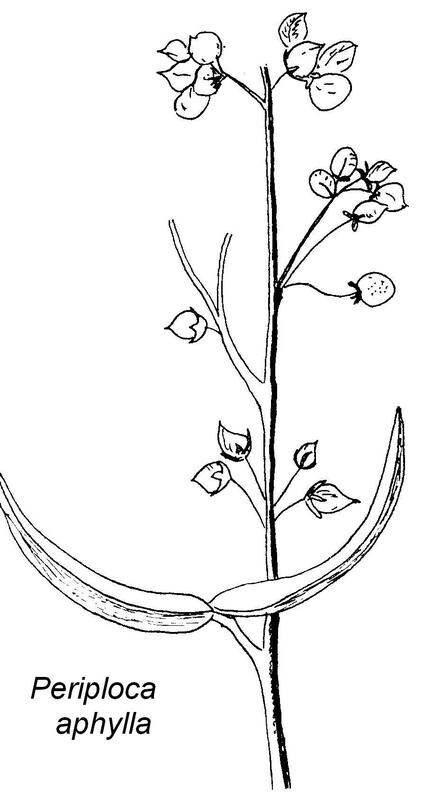 Several non-associated long legumes (up to 25 cms.) were found beneath the shrub but must have been washed down. These pods were found in niches all over the jebel foot, but their source could not be determined. 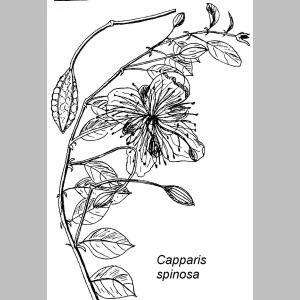 The local caper, Capparis spinoza was well represented by numerous hanging plants. The largest were in the lower mountain reaches, though examples were noted at least 150 metres up. The flowering season was past, but several bushes sported the characteristic small cucumber-like fruits. The leaves of this plant are thick and tough but nevertheless a high proportion had been mutilated by caterpillars (Hawkmoth sp.?). One caterpillar was collected. C. spinosa is extremely hardy and can apparently resist a high degree of mistreatment by insects and animals. The plant normally flowers in late summer, the large white petals opening out just for an hour or two after dawn and then closing up again for the rest of the day. Several very dense clumps of Pennisetum divisum had colonized the rocky jumble where the wadi emerged from the foot of Hafit. There were very few flower heads and no recent growth but this grass had clearly benefitted from rain within the previous year. Individual stems were measured up to l.5 metres long. Another tiny grass, in bright green clumps up to 15 cms. high, was also recorded in the same locality, but not identified. An unidentified dark green plant with yellow flower-heads was common along the wadi banks, in profusion locally. The flowers were past their prime, but other examples of this plant were recorded at the northern end of Hafit the same day in full flower. Somewhat akin to Rhanterium or possibly Helichrysum spp. 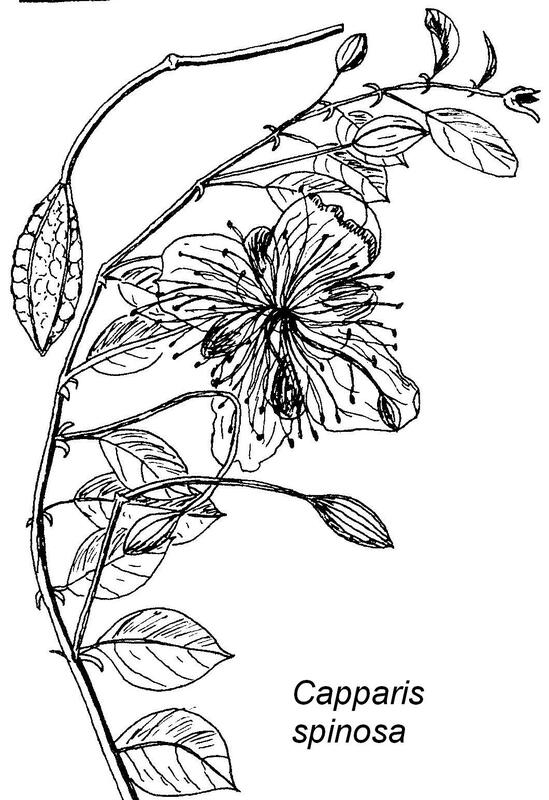 the plant was growing up to half a metre tall with very narrow linear leaves and clusters of flowers protruding beyond. The inflorescences were yellow-tipped, otherwise white. The visual aspect from a distance was of uniform yellow flowers. 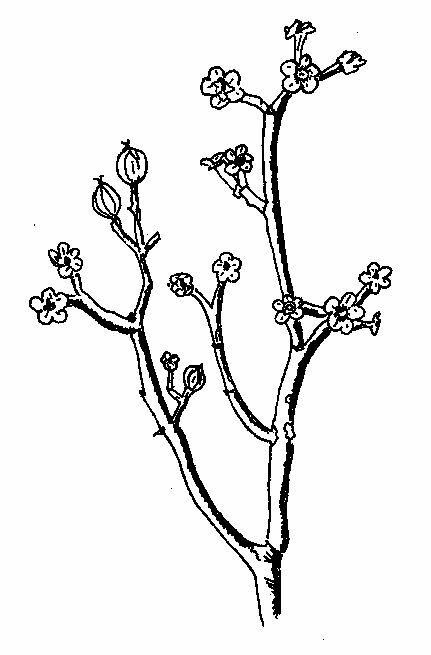 The main stem and branches were thin, reddish-brown, all the branches spreading from the stem base. A few specimens of a possible Tamarix species grew throughout the lower jebel latitutes. This small tree (T. aphylla?) had very smooth, linear and tapering dark green leaves. The stem and branches were purplish-brown and knobbly. Clearly this whole area contained a series of micro-habitats and other plants were noted but not identified. Allover the lower part of Hafit there are nooks and crannies, pot-holes and caves and cliffs each offering varying ecosystems. Higher up, where the mountain becomes increasingly steep and precipitous there is a falloff in vegetation cover. A survey of the higher regions would be a useful addition to our knowledge of the flora of the Eastern Region.